Each ballot qualified party in California has their own sections of the California Elections Code that address, primarily, two topics: Presidential Primaries and Party structure. These code sections must be approved of by the state legislature. Until then, a newly qualified party must operate under the code of an existing party. When the Green Party of California (GPCA) qualified for the ballot in January 1992, it chose the Elections Code of the Peace & Freedom Party and also won the right in court to have None of the Above and other reforms, before losing them upon appeal in 1995. 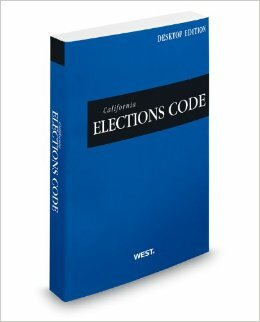 In October 2015, after many years of work, a Green Party section of the California Elections code was signed into law. • October 2006: Technical Correction. The final version for circulation (Oct. 2006 R3) is available, with the changes incorporated, in .rtf or .pdf format. After the code was adopted by the GA, an inaccuracy was found in section 7929. An undocumented change had made its way into the code resulting in this section being inconsistent with GPCA bylaws. The issue was discussed on the ERWG list and the source of the change could not be determined so it was concluded to be an unintentional change. Accordingly, Section 7929 was changed to match the bylaws. A change document shows the wording changes and provides details of this action. The notes on needed bylaw changes have been removed from this revision. See the April 2006 document for those notes. • June 2006: Code Draft.The draft of the GPCA Elections Code presented at the Ventura General Assembly and approved by consensus without amendment. There is a list of needed bylaws on the last page. It will now be submitted to the legislature for adoption into the CA Elections Code. You can download this document in RTF format. Changes to the code since the December 2005 draft. • April 2006: ERWG sub-committee submits draft code to General Assembly. Proposal. The proposal contains background info and explanations of the major features in the proposed draft. The only substantive change from the December 2005 draft is that Limited Voting is included as an option for counties rather than a requirement. Several edits have been included as well as embellished explanations. • December 2005: ERWG Sub-committee submits draft code to General Assembly. Proposal. The proposal contains background info and explanations of the major features in the proposed draft. The proposal was withdrawn by the presenters. Code Draft. Draft of the GPCA Elections Code presented at the Yolo General Assembly. There is a list of needed bylaws on the last page.You can download this document in PDF. Changes to the code since the June, 2004 draft. • June 2004: ERWG Sub-committee submits draft code to General Assembly. • March 2004 ERWG Election Code sub-committee has its first meeting and proposes timeline to General Assembly. Notes from ERWG meeting at the General Assembly: #1, #2, #3, #4, #5 and #6. • January 2003: ERWG request submitted to Assemblymember Laird asking for assistance in creating GPCA Elections Code language. • September 23, 2001: GPCA General Assembly approves the Election Code proposal. General Assembly (San Mateo) approves by consensus the ERWG Elections Code proposal "attempt to pass legislation: empower the Electoral Reform Working Group(to find a legislator): direct the Electoral Reform Working Group to (work with other parties)." • February 7, 2000: Electoral Reform Working Group progress report summarizing activities of the previous year and laying out plans for the next two years.